Yep, about halfway through the month of December, lights appeared on the cedar trees! I always look forward to when this happens, but usually end up pretty disappointed by the random scattering of lit trees. Why can’t they all have lights? >_< Ah well, it's still pretty! I thought it was nice that at least these two trees framing the bridge were lit up! Took the opportunity to take a few more scenery pictures with the full moon+aurora+lights on the trees. 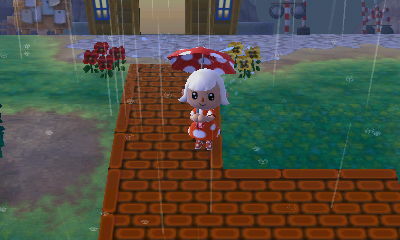 I was a bit sad I couldn’t update my dream address at this point, since my town was still messy and under construction. I found Gulliver washed up on the beach, astray from his destination to Germany. Seeing him mention fairytales here made me wonder if maybe German architecture (along with Russian?) was the inspiration behind the fairytale PWP series in AC:NL. Wish I knew more about architecture so I could know these things for sure. 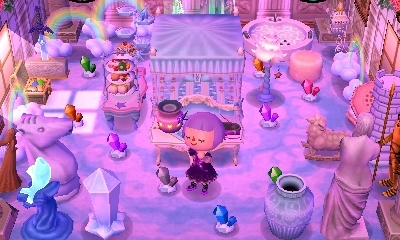 I’d already gotten the nutcracker (Gulliver’s Germany souvenir) in a trade on an AC forum — didn’t realize I would get it on my own so quickly! Woohoo, finally got the golden shovel! 😀 Fertilizer is very useful, but I’m glad to no longer feel obligated to buy it every single day 😛 If the golden shovel works the same way as it did in AC:WW, I guess this means I won’t have to buy oak saplings anymore, since I can just plant 100 bells (it’s raised to 1,000 bells in this game) to grow a tree. I was bored of flower re-arranging one day and decided to work on a pattern based off the brick bridge instead. ^^ It’s the same idea I had when I made this brick path way back when, but I think it came out better this time. I haven’t made border pieces for it yet, though, but maybe I should go ahead and add it to my QR codes page anyway! One day it was really cloudy and the lighting was strange, making the water reddish! Charlise letting me know it’s her time to move. It’s about time. 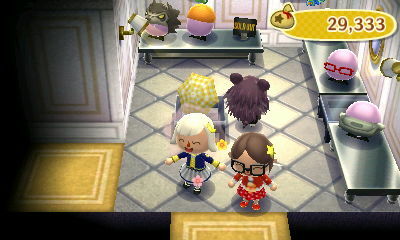 >_> She’s been in my town for a while, since back in August, and I’ve been wanting her to leave so I can move in a new dream neighbor and put a lighthouse where her house is. Ironically, she’s the one who requested a lighthouse! Isabelle gave out glow wands for the occasion. All four of my characters got blue glow wands, and I’m not sure if it was bad luck or what, ’cause I’ve seen glow wands of different colors in dream towns and stuff. I didn’t feel like resetting for different ones, though. The sky was especially dark and clear on the winter solstice, and what’s more, I felt like the usual nighttime palette of snow, buildings, plants, etc. was changed as well. o_o The shadows on the snow were deeper and some of the light-colored flowers seemed to glow in a strange way; it was kind of eerie. I’ve gotten a few baskets of foreign perfect fruit from friends, and sometimes I like to give them to neighbors (especially favorite neighbors) when they ask for fruit. ^_^ This time it resulted in receiving my third pic from Melba! The koalas were onto me! To replace her, I asked for a dream neighbor, Bunnie, to move in! 😀 She’s the first peppy I’ve had in town since Carmen moved out a while back, and it’s another peppy bunny! I reset for her house to be near the newly built lighthouse, since I think they coordinate a bit with their warm colors (orange/red). New badges! Though I didn’t get them at the same moment; I got the Heavy Sleeper one a while back as I was working on finishing that villager house exterior guide. Never seen a neighbor fishing in the ocean like this before! Hehe yay, finally it’s 2014 in Citalune~! I brought Lyra out to get some sparkling cider and noticed that the fireworks really brightened up her garden (which doesn’t usually look that good at night). Posted on March 28, 2014 by Amy •	This entry was posted in AC:NL, Citalune and tagged Animal Crossing. Bookmark the permalink. German actually did inspire fairy tale PWPs. Marchen is German for fairy tale. O_O Sorry.. I realized it’s at the top… I’m tired..
How does the reset thing work? Purrl and Curly moved in really inconvienient places, and I don’t know when new people arrive. – When your town is at 10 villagers, it’s completely full and no one can move in. – When your town is at 9 villagers, you won’t get a new villager unless you: (1) invite someone from the campsite, (2) invite someone who is packed up to leave another town, (3) pick up someone’s “voided” villager after a WiFi, or (4) pick up a voided villager via StreetPass. In all these scenarios, if you pick up a villager in any of these ways, the house plot will appear the day afterwards. 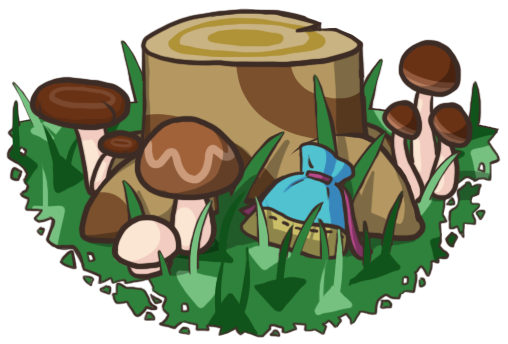 For example, if you pick up a villager via WiFi, the house plot will appear the day after the WiFi. – When your town is at 8 villagers, you can get a new villager in all of the same ways above (campsite, invitation via WiFi, voided villagers via WiFi, StreetPass), but there’s also another (new) way. Now that you’re down to 8 villagers, the game really wants you to get a new one, so every single day when you’re at 8 villagers, there’s going to be a chance that a new house plot will appear. The chance of there being a new house plot is small at first, but the chance increases each passing day. After a week of being at 8 villagers, the chance is 100%, so then you’re going to get a new villager no matter what. So it’s really only unpredictable when you’re at 8 villagers. When you’re at 8 villagers, it’s best to do the reset trick (load up the game with a new character) pretty much every single day, since there’s always a chance of a house plot appearing. If there’s a house plot in a bad place, reset and load again with a new character. The house plot might not be there this time, or it might be in a better place. Keep trying until it’s in a good place, or until there’s no house plot at all, and then build a (temporary, if you want) tent for the new character and save the game. As for the reset trick itself, all it is, is loading with a new character on a day you’re expecting a house plot to appear (which as we’ve gone over, is either after you’re invited someone to move into your town, after a WiFi, after a StreetPass, or whenever you’re at 8 villagers). So don’t load up with your mayor on these days; load up by making a new character, talking with Rover, and running around town looking to see if the house plot is to you’re liking. If it is, save the game by building a tent and getting a town pass card with Isabelle, and if it isn’t to you’re liking, reset without saving and load with a new character again until it is. Oh and I guess I should add that the reset trick method can be pretty tedious and can require some dedication; it’s not fun to do and it can take a long time, and it’s not necessarily for everyone. If you think this is all too much, maybe just try reserving areas that you want to keep house-free by putting PWPs there. Teru has done this with wisteria trellises, I’ve done it with fairytale streetlights, and maybe you could do it with some illumination PWPs or something (I’ve seen that you like those ^^). In regard to what Gulliver says, when people mention castles in Germany I think they typically think of Neuschwanstein Castle, nestled on a hilltop surrounded by forest, and very fairytale-looking from some angles. At least that’s what I thought of straight away, but now that you mention it, the fairytale station and bridge look like it could have been inspired by this kind of architecture. Yeah, I think it’s neat how they can tell you about aurora sightings! I wish it were the same for rainbows and meteor showers, I’ve probably missed some of those. (Meteor shower notices show up on the bulletin board, but sometimes I forget to check it :P) I do think that cloudy day with the reddish water was something a bit out of the ordinary from the usual weather, and I think it’s cool how many different lighting conditions, weather conditions, etc. there are in this game 🙂 Makes it fun to see what’s in store for each day! Oh that’s a bummer about it being 1000 bells this time…I guess it might still be worth it to not clutter up my storage with saplings quite as much. Omg wow that castle looks amazing *_* Some of the photos of it don’t even look like real life! Thanks for giving a bit more perspective on what Gulliver meant, I googled “German architecture” and don’t remember seeing that castle. Yeah I went around planting 1000Bell bags anyway, in preparation for cherry blossoms (better than nothing cos I didn’t stock up on normal saplings). Here’s hoping they turn pink like normal. Me too 🙂 Love cats in general, not just in AC! Thanks for the feedback on Erik vs. Doc! I actually decided on Erik in the end, but messed up when doing the reset trick. I wasn’t paying 100% attention and before I knew it, Isabelle was loading the game up instead of me talking to Rover with a new character, and Erik’s house was in a bad place. -_- So I guess I’ll let him move out whenever he chooses to, and move in Doc after all. Yeah, I just feel weird not having all the personality types, because I’d be leaving out a good chunk of the possible dialog in the game. But I can definitely understand wanting more of your favorites and/or favorite houses as well 🙂 Most of my favorites are normal characters.